Phase transformation in shape-memory alloys is known to cause electric resistivity variation that, under electric current, may conversely influence Joule heat production and thus eventually the martensitic transformation itself. A thermodynamically consistent general continuum-mechanical model at large strains is presented. In special cases, a proof of the existence of a weak solution is outlined, using a semidiscretization in time. This research has been facilitated by the European project MRTN-CT-2004-505226 “Multi-scale modelling and characterisation for phase transformations in advanced materials”. 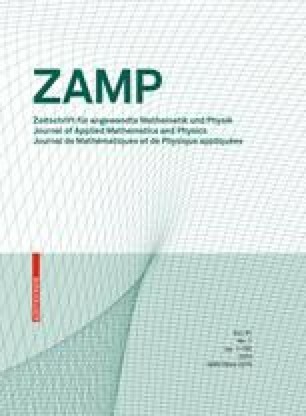 The work was also supported by “Nečas center for mathematical modeling” LC 06052 (MŠMT ČR), and the Project “Modellazione fisico-matematica dei continui elettro-attivi” (INdAM-GNFM, Italy), and also partly supported by the grants IAA 100750802 (GA AV ČR), and MSM 21620839 (MŠMT ČR), 201/06/0352 and 106/09/1573 (GA ČR), and from the research plan AV0Z20760514 (ČR).